This free, printable letter from the tooth fairy congratulates the child on having the best tooth of the month and encourages good dental hygiene. 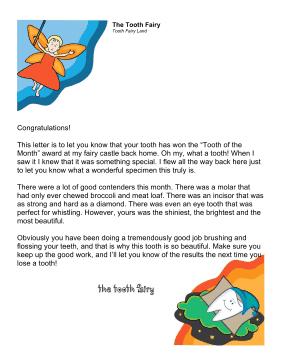 This letter is to let you know that your tooth has won the �Tooth of the Month� award at my fairy castle back home. Oh my, what a tooth! When I saw it I knew that it was something special. I flew all the way back here just to let you know what a wonderful specimen this truly is. There were a lot of good contenders this month. There was a molar that had only ever chewed broccoli and meat loaf. There was an incisor that was as strong and hard as a diamond. There was even an eye tooth that was perfect for whistling. However, yours was the shiniest, the brightest and the most beautiful. Obviously you have been doing a tremendously good job brushing and flossing your teeth, and that is why this tooth is so beautiful. Make sure you keep up the good work, and I'll let you know of the results the next time you lose a tooth!